Peel and dice the apples and place them in a saucepan. Combine the sugar and cinnamon; pour over the apples and toss to coat. Cook, covered, in a saucepan on low heat. Cook until soft, then mash with fork to form a thick applesauce. Allow to cool. 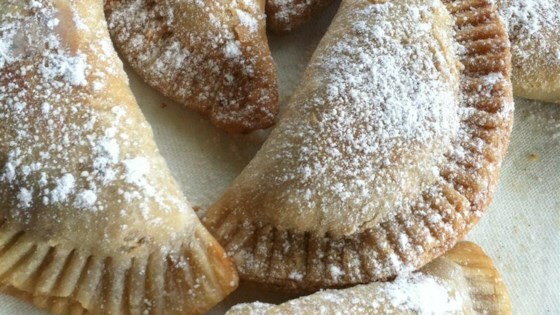 See how to make perfect apple turnovers. You can also fry these in melted shortening or lard. This is the easist recipe to follow. I have never made the crust from scratch before. I have always used canned biscuits. Never again. This is the best.